Cheese was first thought to have been made in Sumeria as an accidental result of the enzyme, rennet, which is found in a calf’s stomach, curdling the milk which a shepherd was carrying in a leather bottle. Many traditional cheeses have their roots far back in history and can be tied into significant dates. For example, Monks accompanying William the Conqueror in 1066 brought their recipe for cheese with them, resulting in the production of the cheese which was to become Wensleydale. 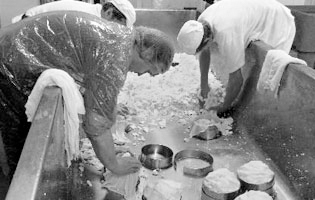 With the dissolution of the monasteries in the UK in 1536, cheesemaking mostly passed to farmers, but this practice was severely curtailed as part of wartime rationing in 1939. It has fortunately enjoyed a renaissance in recent years with more and more artisan products appearing on the market. Given the huge diversity of cheeses available on the market, it is astounding to think that every single cheese (bar those with added flavours, such as herbs or fruit) contains at the most, only four basic ingredients: milk, starter culture, rennet and salt. 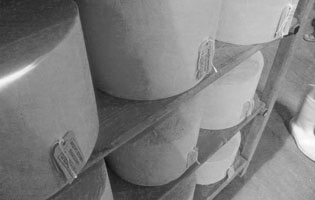 The variables between the cheeses are therefore down to the recipes used by the skilled cheesemakers, although the basic principle remains constant – the separation of curds from whey and their subsequent drying and ripening. The cheesemaker uses either cow, goat, sheep or buffalo milk and depending on the recipe, uses the morning milk, evening milk, or a mixture of both. The milk may be partly skimmed (a very traditional method because fat used to be skimmed off in order to make butter) or have extra cream added. The milk may or may not be pasteurised and various ingredients added, such as natural colouring, or blue or white penicillin moulds. The cheesemaker adds a starter culture to acidify the milk, turning it sour. This converts the milk’s lactose into lactic acid. Rennet is added which helps to coagulate the milk, turning it into curds and whey. The temperature of the milk is carefully controlled, with higher temperatures being maintained for hard cheeses, and lower temperatures for soft. 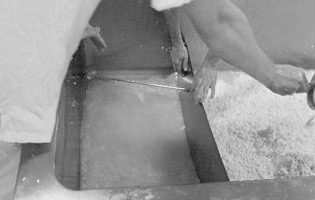 Once the curds have formed in the vat, they are cut to encourage the releasing of the whey. Soft cheeses have most moisture and so require less cutting, whereas hard cheeses which are drier by nature, require the most cutting to let out more whey. 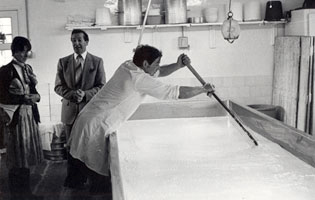 When making Cheddar, the curds are cut into blocks and piled on top of each other at the sides of the cheese vat, in a process known as ‘cheddaring’. Salt is added to virtually all cheeses; sometimes to the curd, sometimes rubbed into the rind and sometimes by soaking the cheeses in a brine solution. It acts as a preservative and flavour enhancer, and also helps to control the acidity of the cheese. 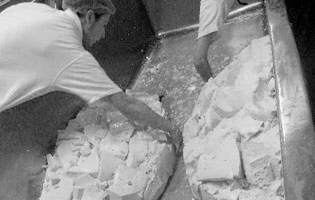 Once cut, drained and salted if applicable at this stage, the curds are placed into moulds and then either left to drain naturally for soft cheeses or pressed (the harder the cheese desired, the stronger the pressing). It is during this stage that the cheese starts to develop its character. Some cheeses ripen from the inside out, such as blue cheeses and Cheddar, others from the outside in, such as Brie, Camembert and Pont L'Eveque. Ripening can take anything from a few days to three years depending on the type of cheese, and can take place in temperature and humidity controlled fridges, or dedicated cheese cellars or caves.